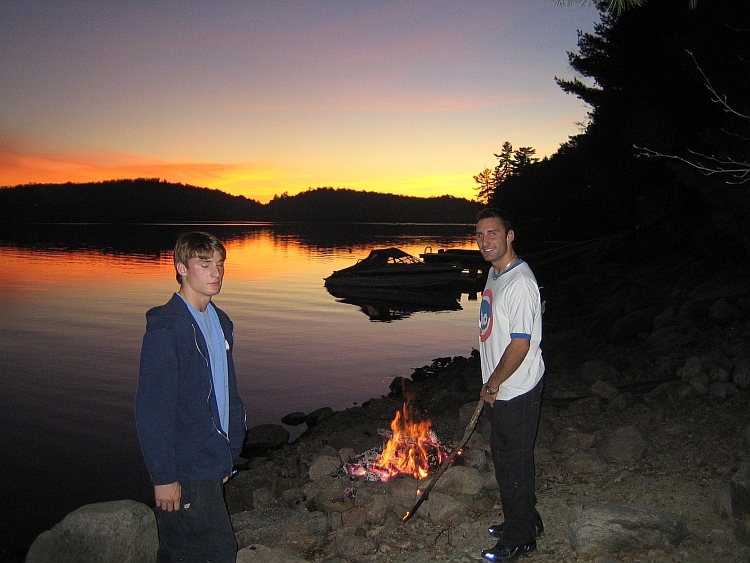 "Moonlight Manor is a four-bedroom executive cottage and offers the best views of full moons and starry nights overlooking the lake." 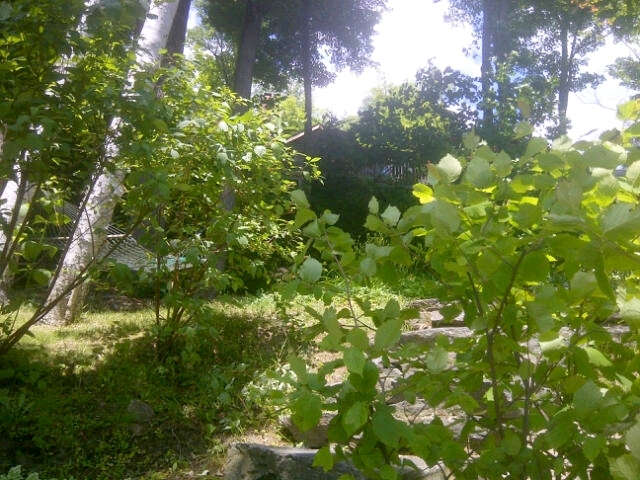 This one-acre property is well-treed for privacy but still maintains a southern exposure for great sunlight . 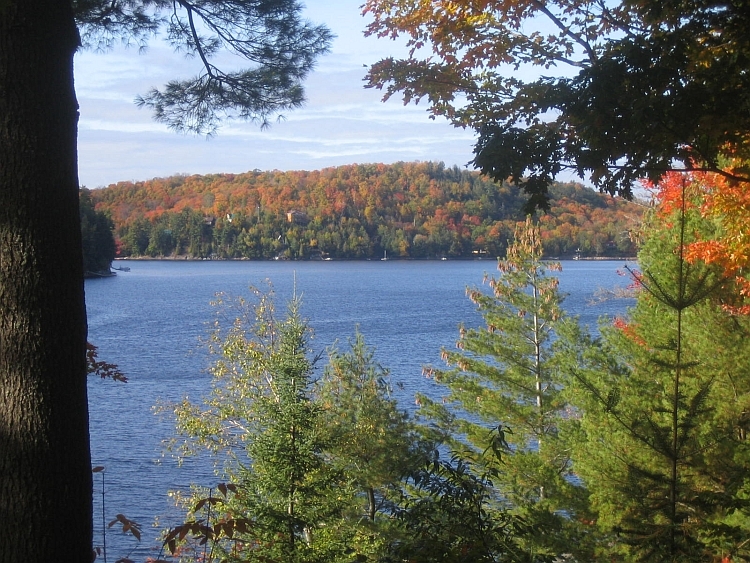 The 105-foot lake frontage is located on clean, deep, pristine Little Kennisis Lake. This south facing, high-end facility has everything it takes to provide an unbelievable venue for the complete family summer vacation. 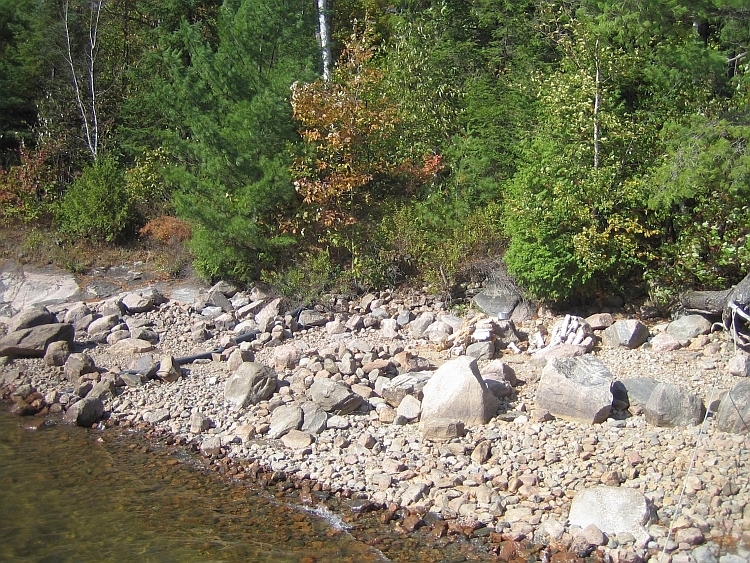 The water is deep enough for swimming off the dock and has small sandy beach by August for younger children to paddle safely. 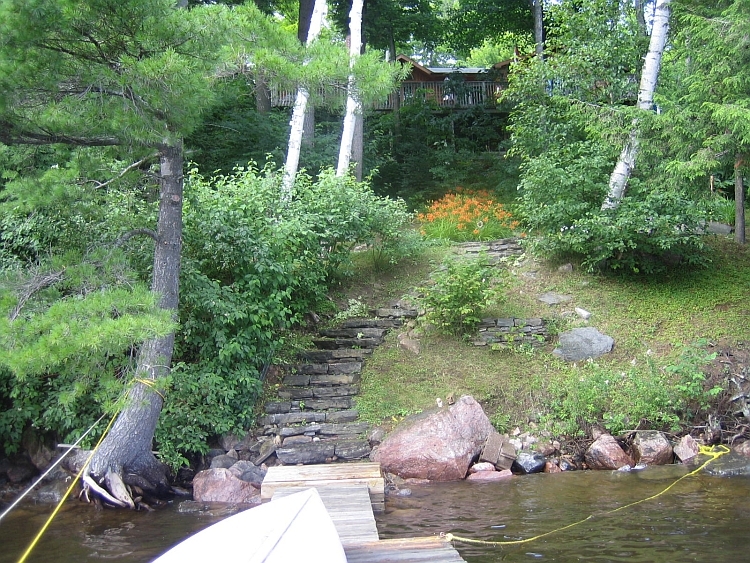 The property also has a flagstone patio near water and a full dock area for sitting and relaxing. 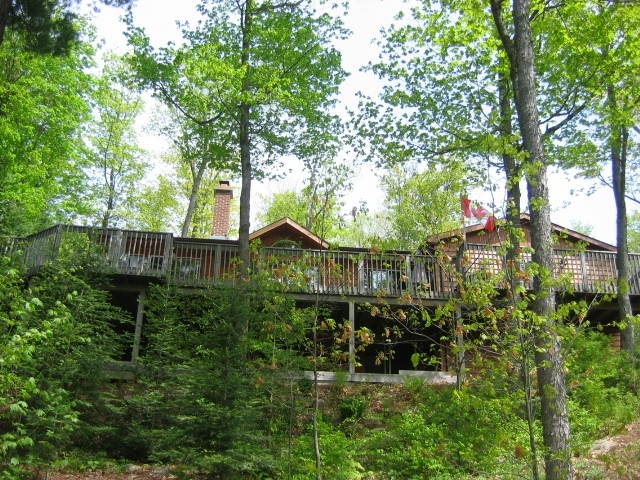 There is a large upper deck overlooking the lake, with three walk-outs from the great room, sunroom and master bedroom. 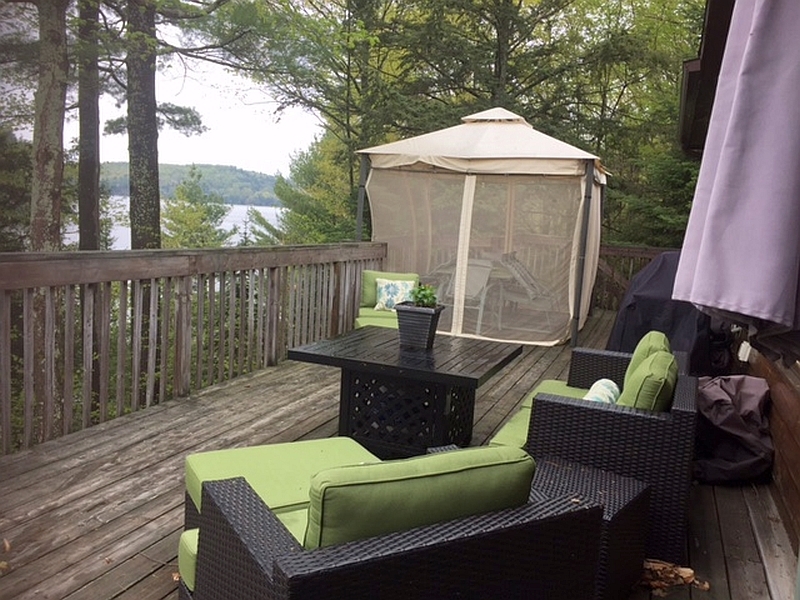 A new tented gazebo has been installed on the upper deck for comfortable dining out during summer evenings. 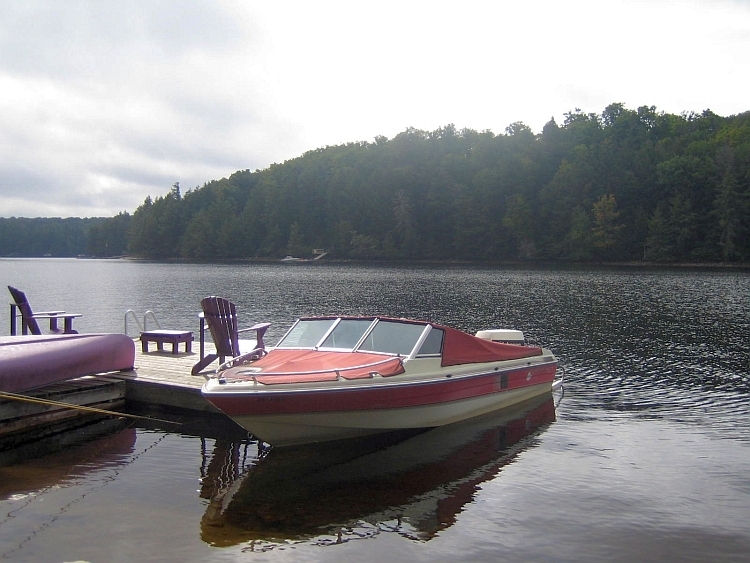 The upper deck has a full set of patio furniture and barbecue which is attached to cottage propane tank so no need for canisters. 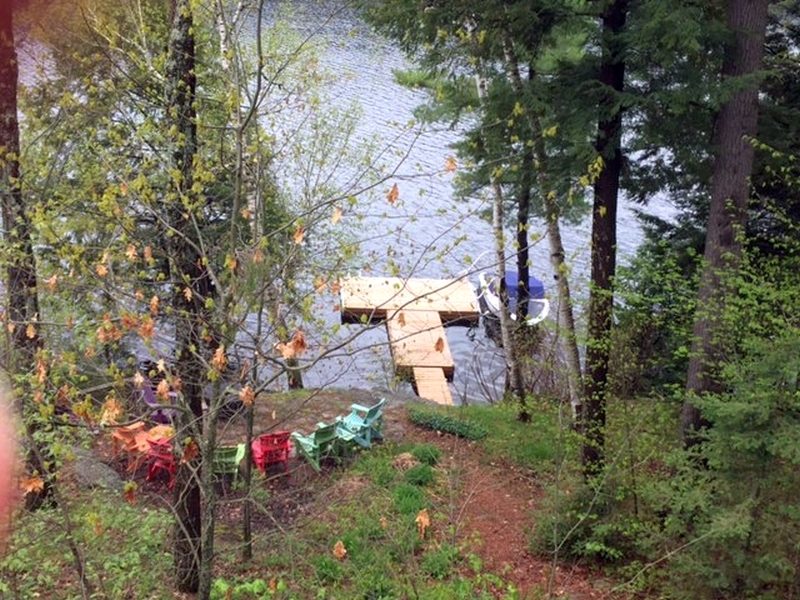 There is also an additional lower deck with walk out from recreation room. 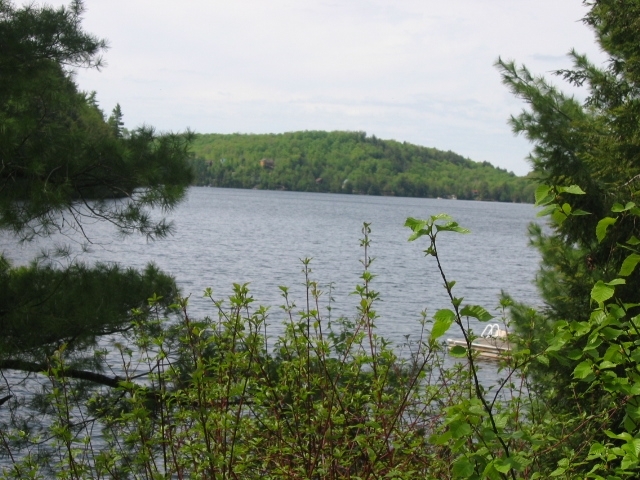 The cottage has hardwood floors with a large pined great room with picture windows overlooking the lake and a ceiling-to-floor stone fireplace with comfortable seating for eight people. 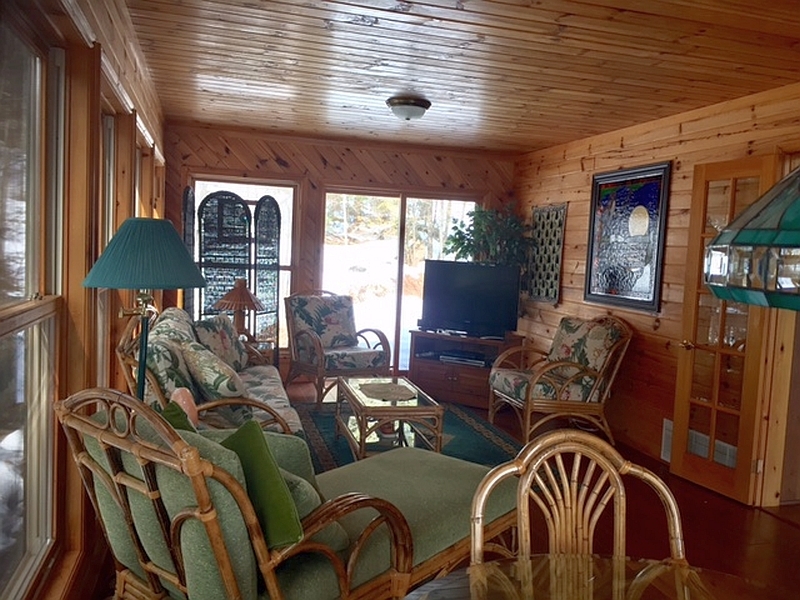 The owner's pride and joy is the magnificent four-season large sunroom/patio room complete with wall to wall windows for panoramic views of the lake. 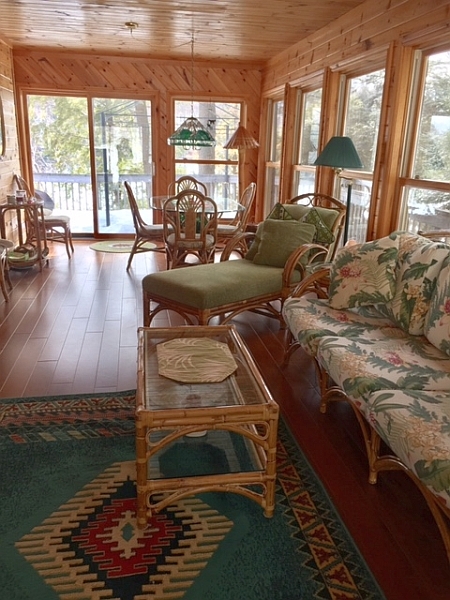 The sunroom is furnished with wicker furniture including chaise lounge, full couch, two chairs and large glass dining table for eight. 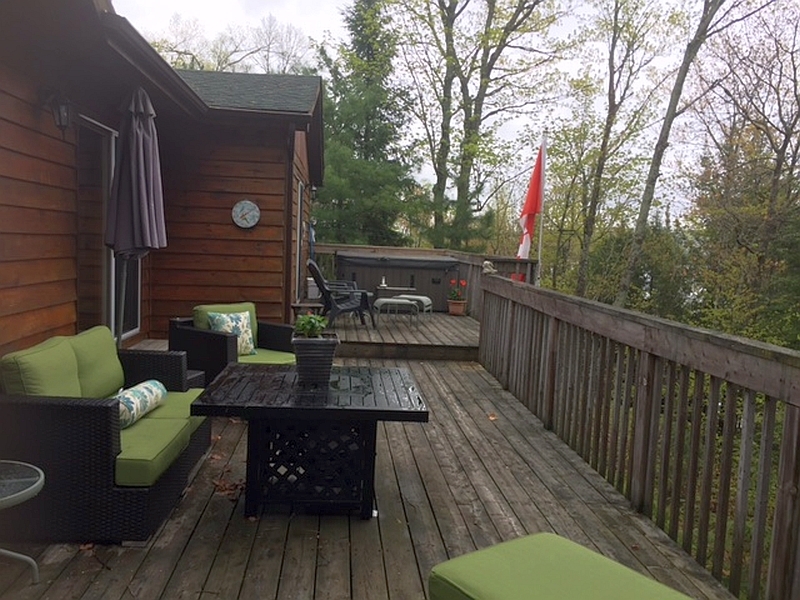 Outside amenities include fishing rods, fire-pit, gardens and hammock, 4 new Muskoka chairs, canoe and kayak (though renters are responsible for supplying their own life preservers).The most recent addition is a 6 seater HOT TUB on the upper deck. 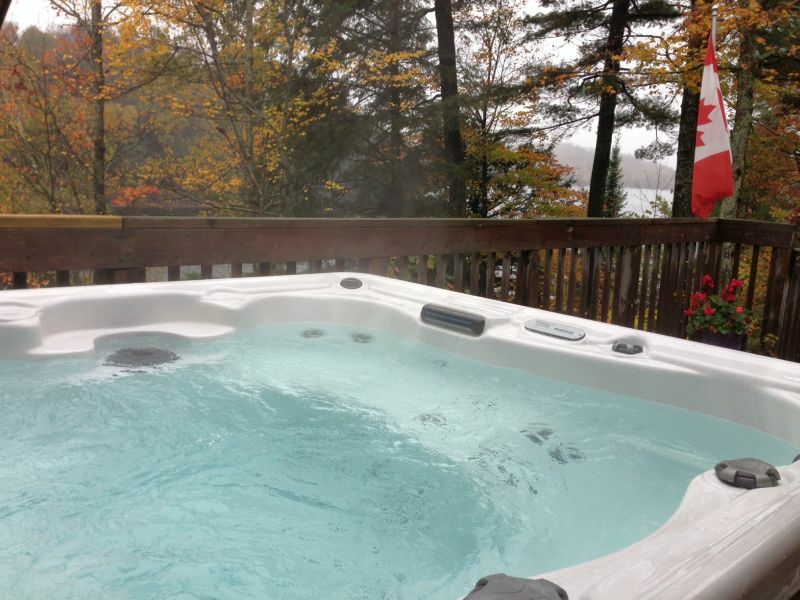 The hot tub has Bluetooth speakers, multiple jets and lounge chairs positioned to look over the lake. 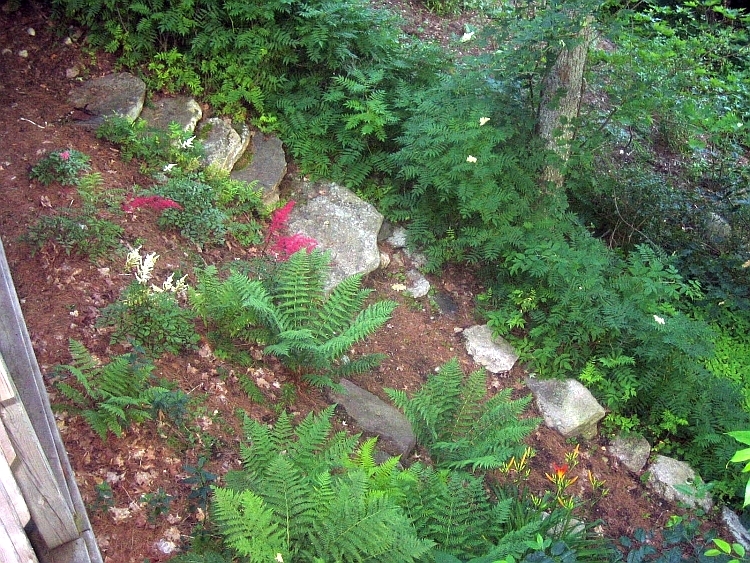 It is a fabulous place to view the stars and moon at night. 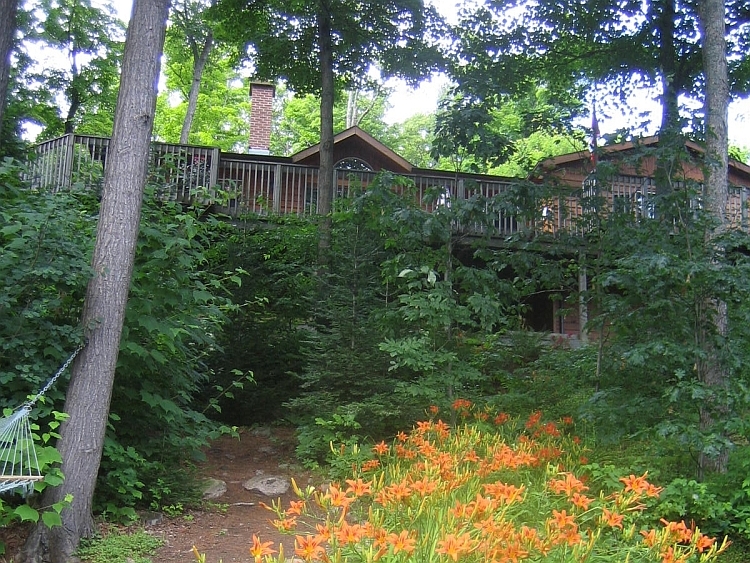 Inside amenities include many board games, hockey table, books, telescope for star watching, land line telephone, 2 satellite boxes, 2 TVs (including a 46" flat-screen TV) and 1 stereo and CD player. There is good cell phone coverage and we have WIFI internet. 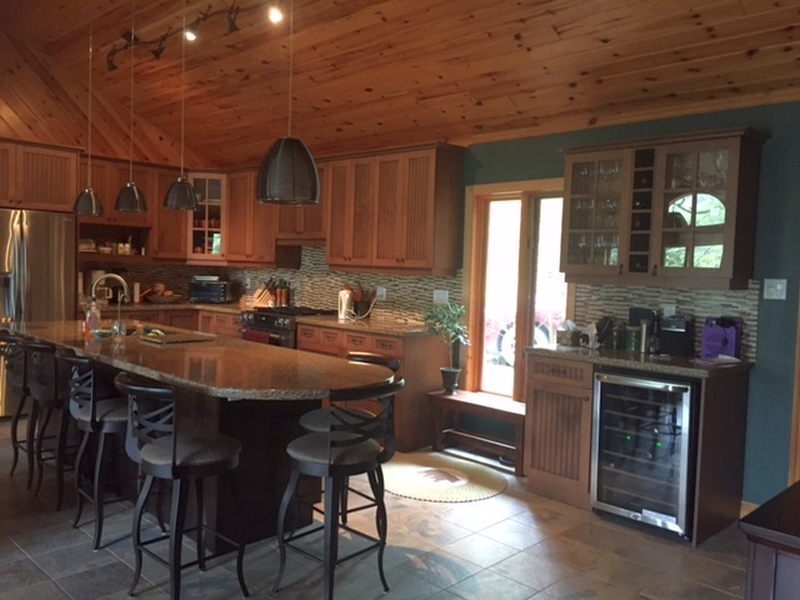 There is a new fully equipped, spacious, open concept kitchen overlooking the great room. 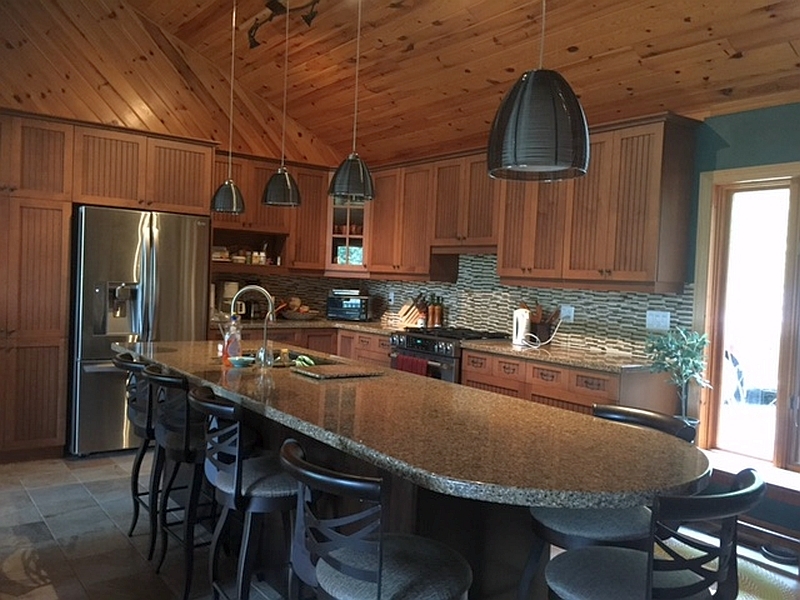 The kitchen is equipped with coffee maker, microwave oven, cuisinart, new toaster oven and dishwasher and stove and fridge and 6 bar stools. The cottage boasts an additional pine dining table in the great room. 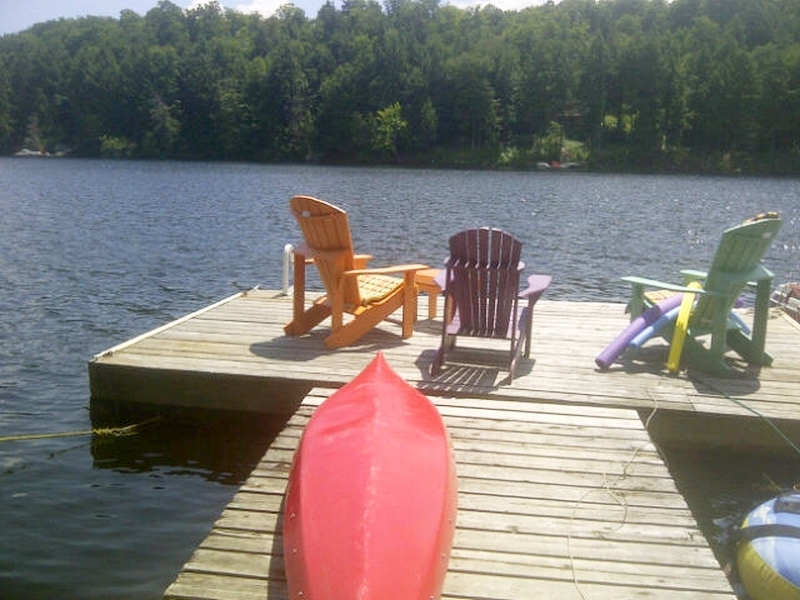 There are 4 bedrooms and 3 bathrooms in the cottage to sleep 6 to 8 comfortably. 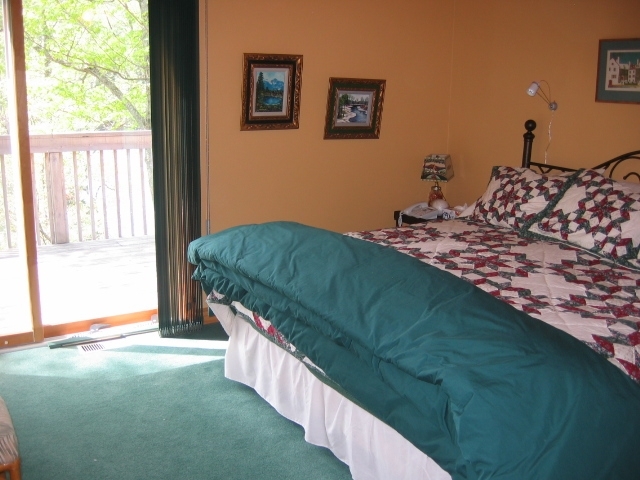 Three bedrooms are on the main floor and one is on the lower level. 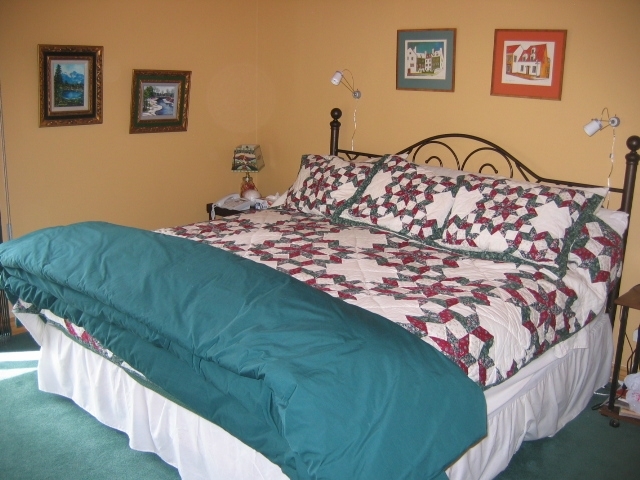 The master bedroom has a king bed and ensuite bathroom with soaker tub and walk-in closet. The 2 upstairs bedrooms include one with a double bed, and the another bedroom has an antique ¾ bed which fits double bed sheets. 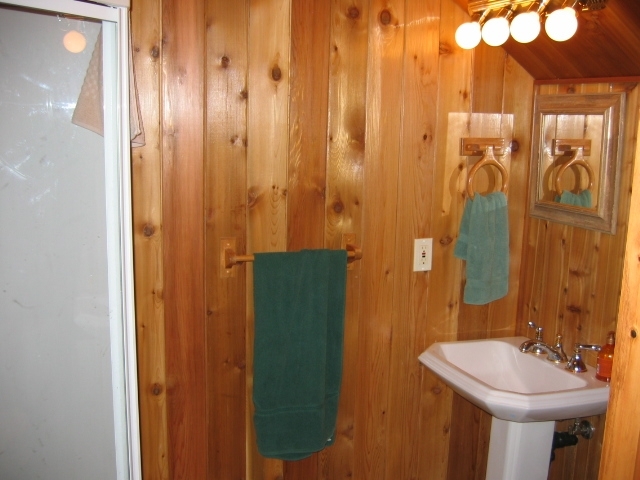 There is one bathroom with shower for the two upstairs bedrooms. The 4th bedroom in the lower level walkout, sleeps 4 single beds configured as one bunk and one single with pullout drawer bed if needed. Singles can be put together or kept separate. 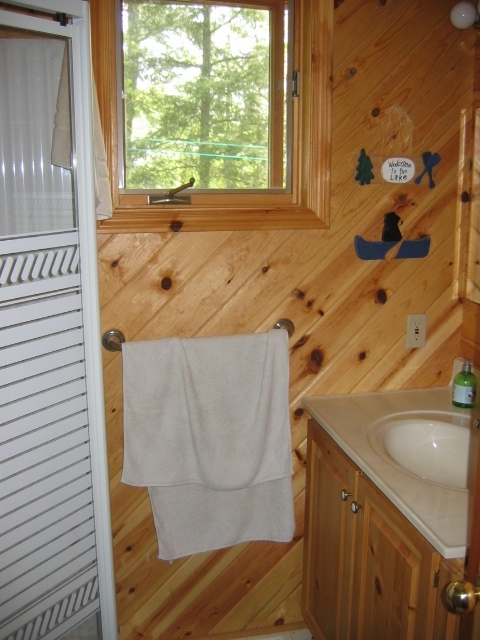 There is a full cedar bathroom in basement with a shower. 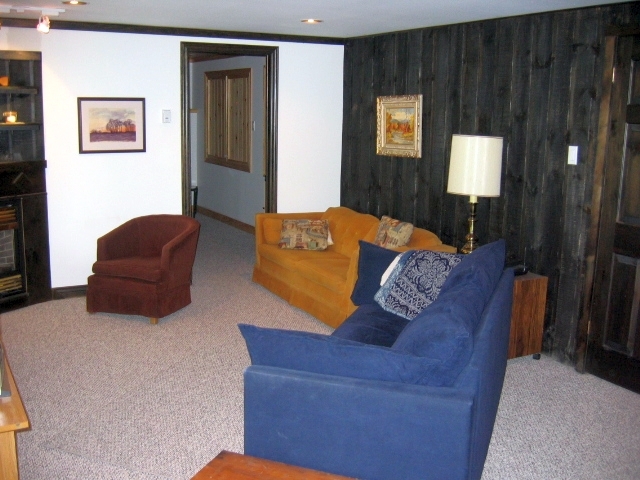 For the kids, there is a large recreation room walled in barn wood with additional TV and satellite with walkout to lower deck. 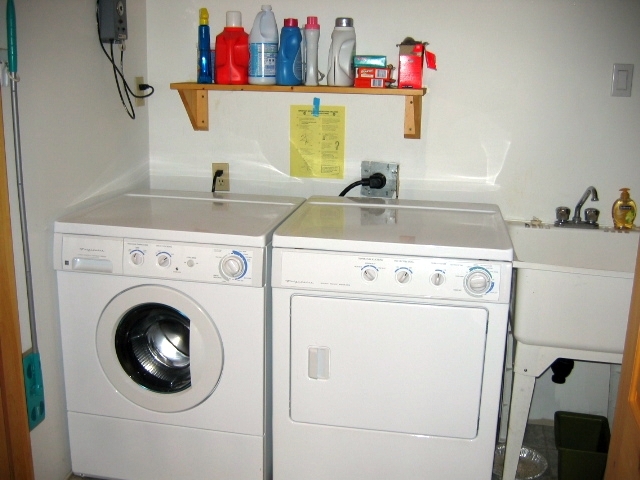 The lower level also has a washer and dryer, and wood cupboard for easy access to dry logs for burning in the great room hearth. 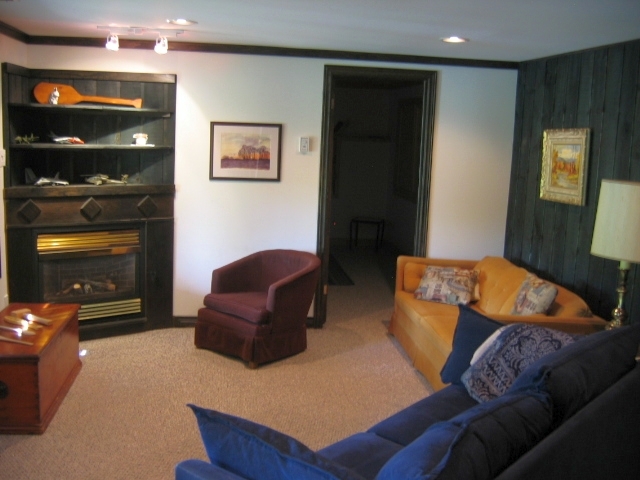 In the lower level there is also a convenient gas fireplace to keep the rooms very cozy on cool evenings. 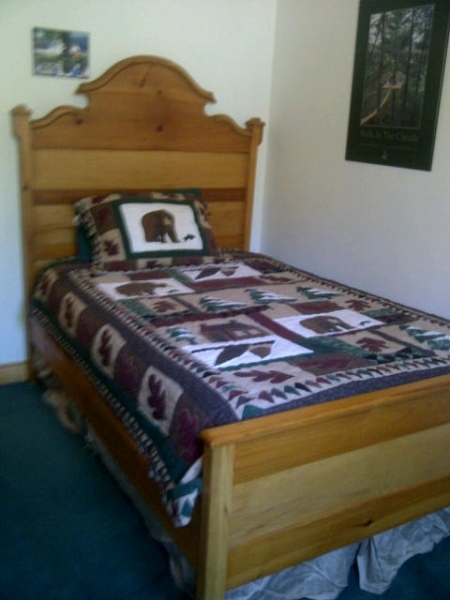 The recreation room includes an extra pullout double bed with a full cedar bathroom. 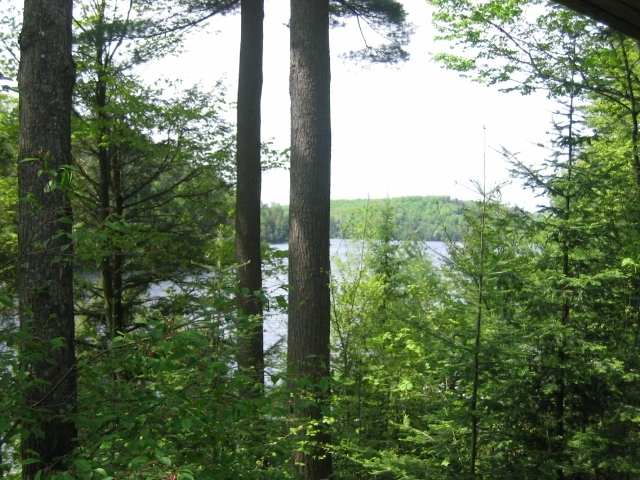 This property provides a wonderful spot for enjoying a luxurious, peaceful, quiet vacation in one of prettiest locations in cottage country. If you've ever dreamed of the perfect venue for a summer holiday with family or friends, then this cottage will meet your needs. 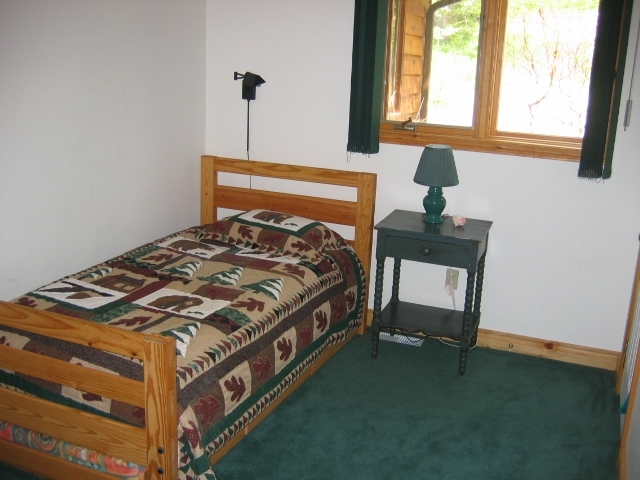 The owners usually offer this facility up for rental during a prime season period in August. See the booking chart for details. 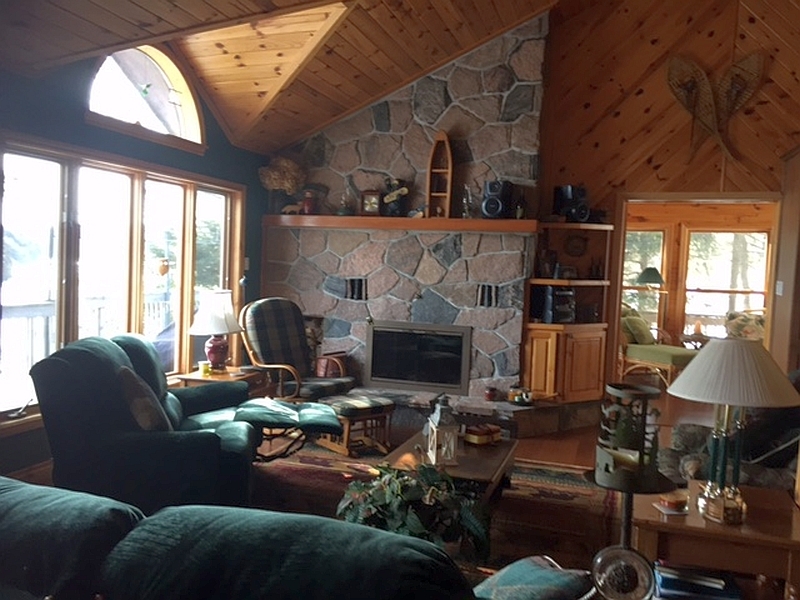 Indoor: Magnificent four-season large sunroom/patio room complete with wall to wall windows for panoramic views of the lake. 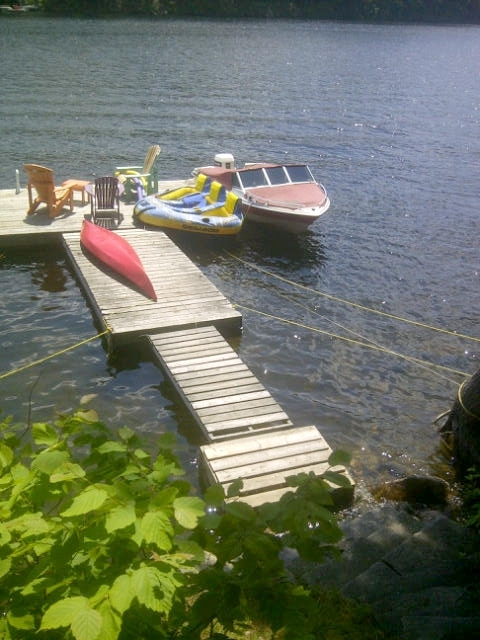 Great room is pined and has a mason fireplace hearth and large deck with 3 walk outs, 2 TV/DVD/VCRs, Bell ExpressVu, hockey table, library, games. High speed Internet. 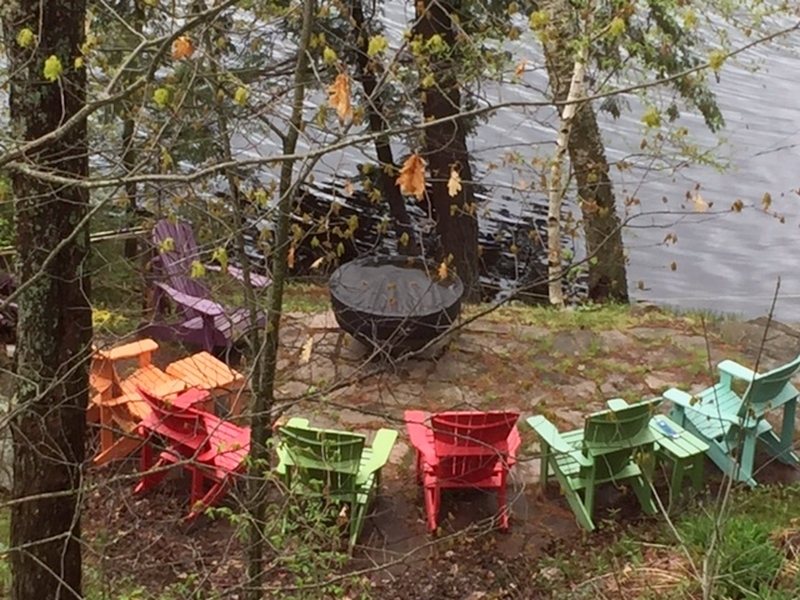 Outdoor: Canoe, Kayak, Flagstone patio near Lake, 2 Full Decks, BBQ and firepit, fishing rods, hammock, telescope, 4 new Muskoka chairs and much more. 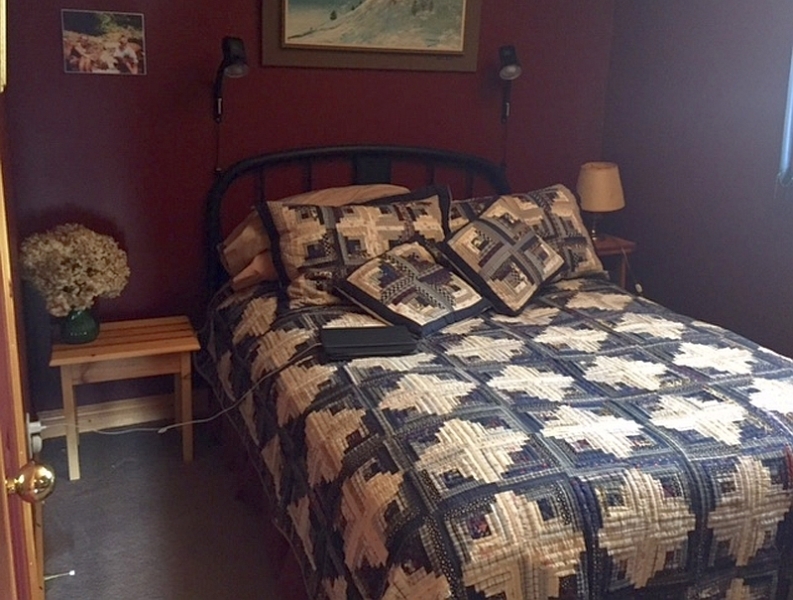 Immediate availability for Moonlight Manor. For later dates, please see the full Moonlight Manor Availability Calendar.